This trip was to be a mutual Christmas present of Paris or London for a weekend, but we decided we wanted to go by train. Then a friend suggested Vienna—also too far by train—which led Ric to think maybe Switzerland. But in the winter? We haven’t willingly spent time in snow for years. 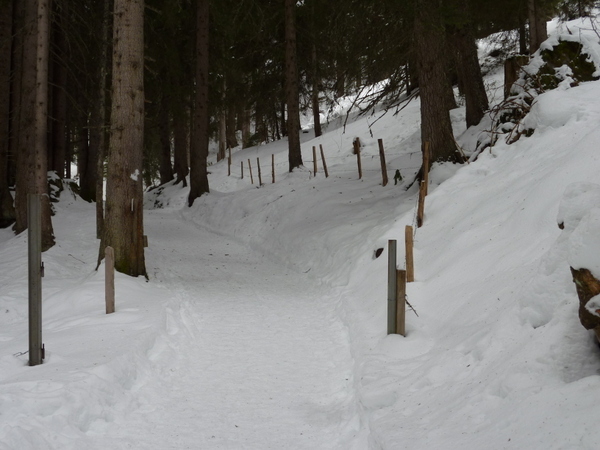 Then I discovered that the Swiss groom trails for something called Winterwandern (Winter hiking) and as hiking always interests us, the planning began. 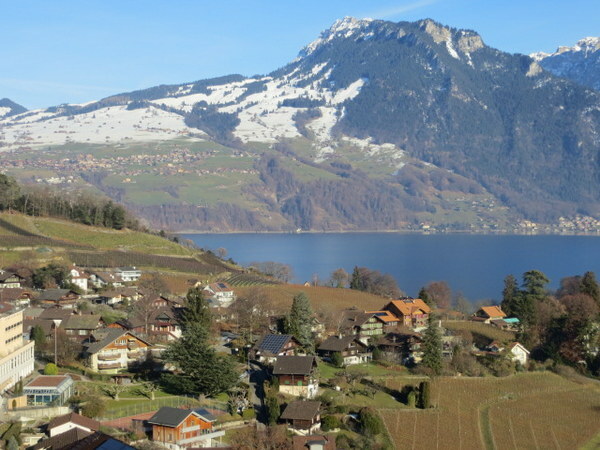 The little Swiss town of Spiez; Snow in the mountains, nothing in the town. When we stepped off the train in Spiez, the first thing that came to mind was the line from the movie “White Christmas” where upon stepping off the train Rosemary Clooney says “There has to be snow! This place is advertised as America’s Winter Playground!” We thought Switzerland in winter would be snow-covered from end to end. We needn’t have worried: Once up out of the valleys there was plenty of snow…and great hiking! January 3 saw us above Lauterbrunnen hiking to Mürren. Of course one can hike up the 700-or-so meters (1800 feet), but why waste energy (and knees) when there’s a fun gondola? Once on top, we hiked almost alone the 1.5 hours to Mürren, paralleling the electric railroad that ferries skiers and non-hikers. Quiet, except for the distant sounds of helicopters doing God-knows-what on the other side of the valley, and the electric glide of the train every 15 minutes. Crunching through snow in and out of forest on groomed trails was absolutely delightful. Trail to Murren, through lovely piney woods. 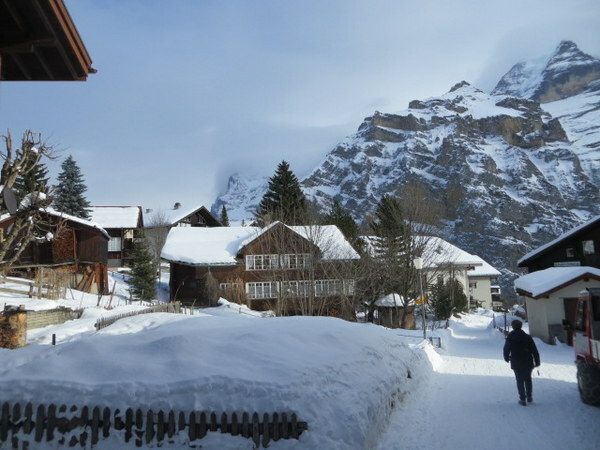 Captivating town of Murren. Only a few service vehicles allowed. Otherewise all pedestrian…which includes people on skies and sleds. 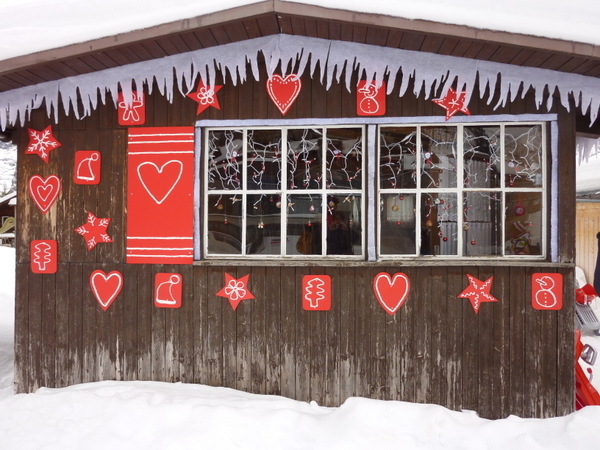 Mürren is cute and definitely on our radar for a future summer trip. 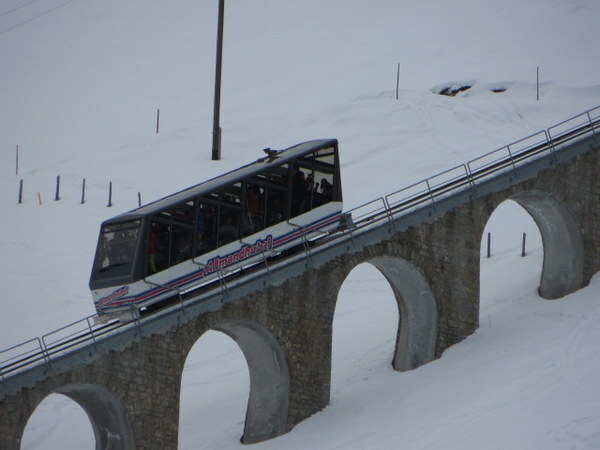 With minimal motorized traffic and typical Swiss architecture, filled with adorable children learning to ski, it is also the jump off point for a ride on a gondola to the Schilthorn and Piz GLoria, a mountain setting featured in “On Her Majesty’s Secret Service” the 007 movie starring one-time Bond, George Lazenby. More intriguing to us, as non-skiers, were the people heading to 9748 feet to ski and snow board down. Yikes! 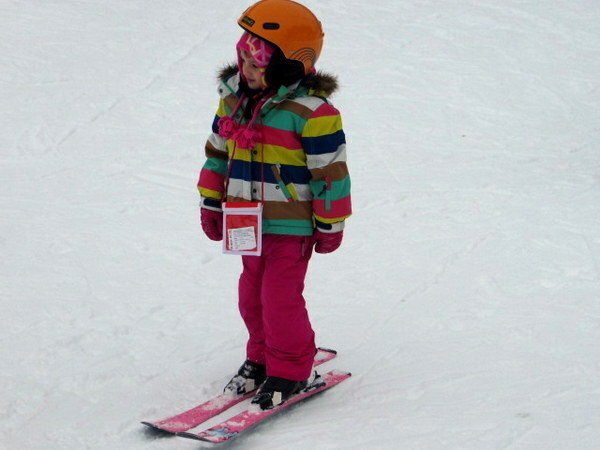 The slopes looked impossible to us (remember, we are from MN and ND originally), but even children were whizzing down them from this amazing height in a snow storm! 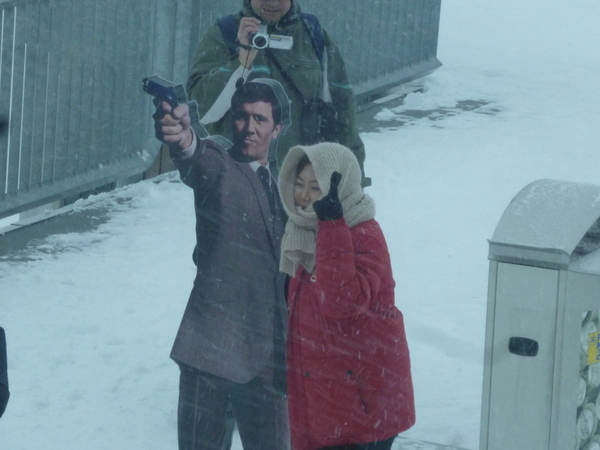 Japanese tourist in snowstorm to have her picture taken with “James Bond”. I stayed inside. Descending via the cable way, we re-entered Mürren and the sun came out, brightening the winterscape and warming our backs as we hiked down to Gimmelwald, a tiny village on the cliff from where one can catch yet another gondola back to the valley floor. 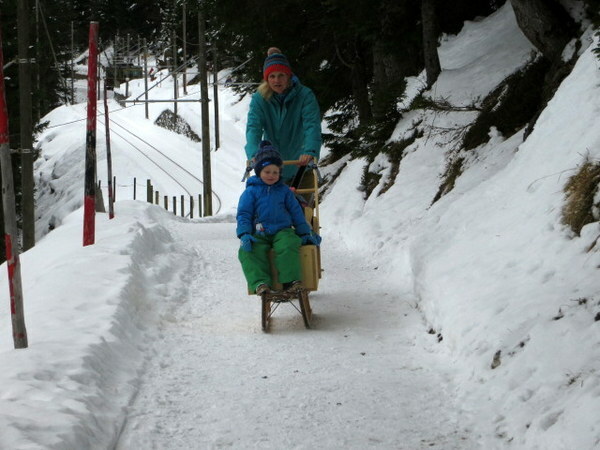 On the way down to Gimmelwald from Mürren we were passed by those commuting on sleds through what would be village paths in summer. No one even came close to hitting us as everyone is very aware of the need to share the “road” safely. The occasional and friendly “Achtung!” warned us to step aside. 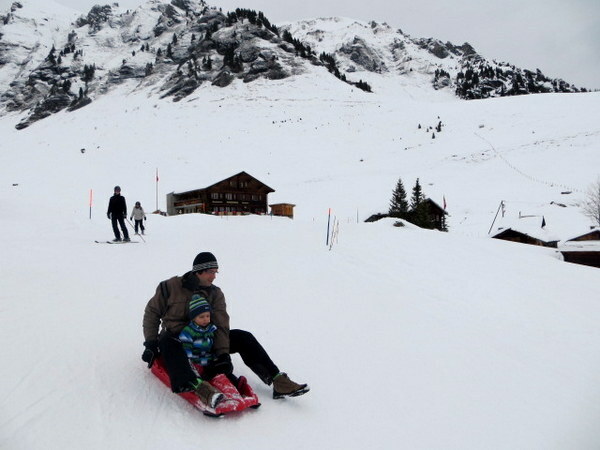 Little sledder spins out on the trail to Gimmelwald. She laughingly recovered. 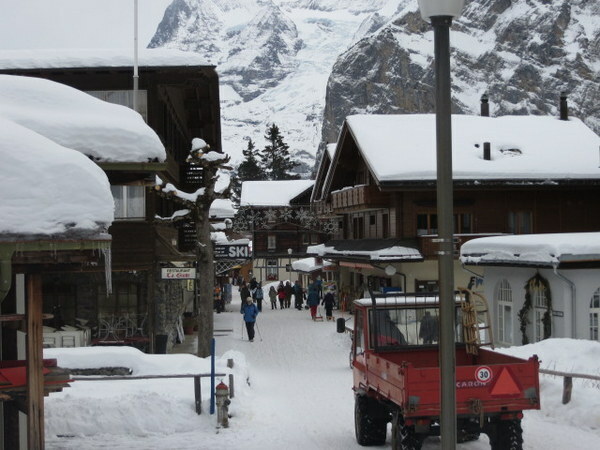 The weather report says 1-3 inches of snow expected in Mürren and Wengen. Better than rain in the valley, so we headed up the cliff again. This time treating ourselves to the train along the cliff top to Mürren, we were joined by a Japanese tour group. The Japanese apparently flock here in winter, not for skiing but for simple sightseeing. There are families as well as young singles, each with a smartphone, iPad, or camera snapping away at the scenery and each other. I was struck by the politeness of the group, standing aside to allow people to descend from the train row by row. After the every-person-for-themselves attitude in public transportation in Rome, it was surprising to have the Brits “minding the queue,” Germans telling their children to “akt freundlich” (Literally “act friendly” but used in the context of correcting a child about to barge through a crowd to get to the front), and now the Japanese bowing to let us out of our row in turn! For those who do not know, there is no queue for bus or Metro in Rome. People do not wait for those exiting to descend before trying to crowd onto buses or trains. It is a free-for-all at every stop. Italians are warm and engaging, helpful and friendly. They will give you free food, the shirt off their backs, and go ten minutes out of the way to give directions, but they’ll knock old ladies out of the way to get on the bus first. In Switzerland there is no free food – they even charge for tap water – but they do line up and allow people to pass on the sidewalk or trail. The Swiss are efficient above all. But I digress…. 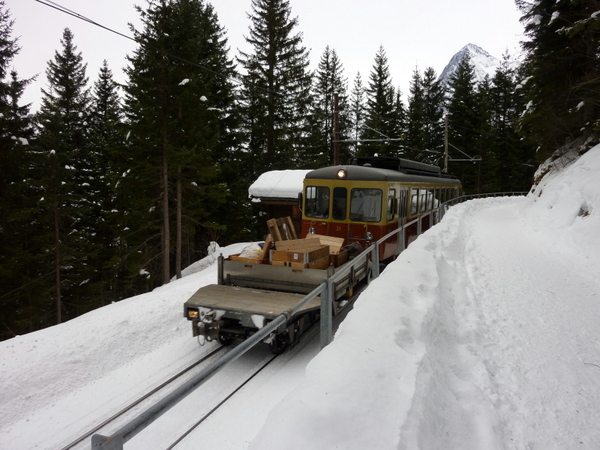 The train to Murren parallels the trail for much of the way. Note the open air baggage car for luggage, supplies, skies. Yet another mode of transportation awaited us, the funicular at Allmendhubel. 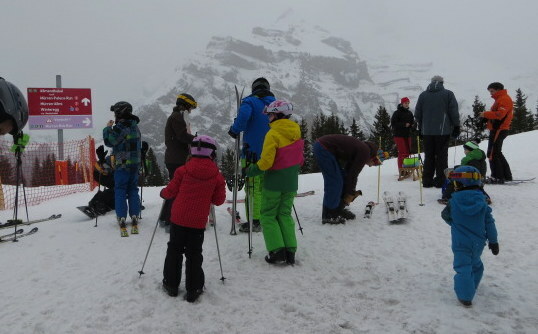 A quick three minute trip took us to the starting point of a downhill hike back to Mürren. The big difference this time is we shared a mixed-use trail with skiers and “sledgers” as translated into English, the people using the “bob run.” It was a little disquieting to have tiny children as well as adults flying by us on skies and on sleds for what must easily have been a 6 km downhill run. Once again, everyone behaved beautifully and watched where they were going. I doubt we’d have as much luck in the U.S. on such a run as evidenced by my friend Heather who was run down by a sled a few days ago in Oregon. Grazie a Dio she wasn’t injured. Here, if someone ran you down, you might go flying off a cliff! Sharing the “trail” with sleds and skiers. A final word on food here: There’s little variation. I know, some of you are thinking “Italian food is all the same” but I beg to differ! There are 10,000 <sic> pasta dishes, there’s risotto, there are fagioli, vegetables beautifully prepared, seafood galore. Sure we have salumi and cheeses in Italy, but meat is often only a small portion of the meal. Here it seems every restaurant’s menu is the same as the next. Raclette, fondue, rösti: everything is bathed in cheese, there’s a huge emphasis on meat and potatoes, and the major form of vegetable is salad. The “Italian food” served here in the Berner-Oberland is more like the American-ized version, not the preparations we have come to love. The bread is phenomenal, though, and breakfast is more than a croissant. The coffee comes in large cups and is robust. While I love my Italian espresso shots, sitting here in the cold a larger cup of coffee seems right, although it costs about as much for a cup of coffee (no refill!) here as it costs for a great panino for lunch in Rome. Tomorrow we return to Rome. We’d love to hike this place in the summer for comparison, but it has given us resolve to go to the Dolomites next winter. Maybe we’ll have a White Christmas in Italy’s Winter Playground. At least we know they serve Italian food there. It’s still Christmas here! 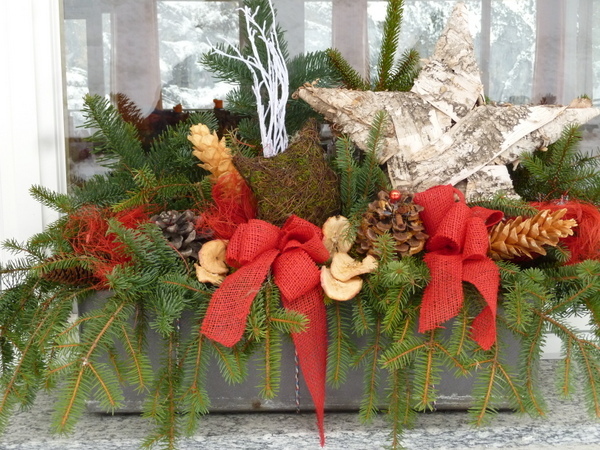 Ends with Epiphany, January 6! Oh Laurel, youve added yet another beautiful destination for my future trip list! So nice that you and Ric are getting out and seeing so many places. Love the idea of the groomed trails for hiking in snow! Happy New Year Karen! It’s excellent to have a future trip list! Mine is ever-longer. We are so fortunate to be here and able to more easily take advantage of short treks. It’s great to hear that you had such a wonderful time on your Winterwandern trip to the Berner Oberland. Hopefully it was everything you expected (and more). I can very much appreciate your comments about the food as I always eat well in that area (not good for my waistline) and the breakfasts have always been substantial. Hopefully you had time for a fine hot meal in the revolving restaurant at Piz Gloria or a “Martini shaken not stirred” in the James Bond Bar. Your advice in advance of the trip was most helpful, Ken. Really appreciate it! We did have lunch on top at Piz Gloria. No bargains there, but I’d do it again in a heartbeat for the view. Thinking about returning in early September to see what the place is like without snow. Well, I felt I was on a holiday with you and Ric after reading this. You made it sound so enticing and I could feel the cold too. That big cup of coffee warmed me up tho’ …a great way to start your new year! Enjoy and I look forward to your next post. Thanks Mary! We certainly had fun!